Diagnosis of a vertical root fracture is very difficult. It sometimes frustrates me to see how quickly some people diagnose a root fracture. I tell my patients that I like to rule everything else out before I make that assumption. I say assumption, because unless you can visualize the root fracture, you are making an assumption. There are some clinical signs that can be associated with a vertical root fracture, however, they are not 100% diagnostic of a vertical root fracture. For example, a long narrow periodontal pocket is often associated with a vertical root fracture. 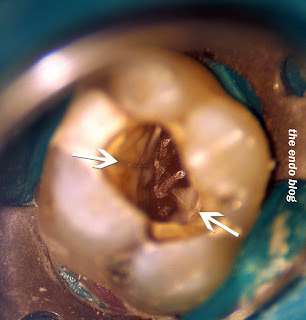 The periodontal attachment breaks down along the fracture line, creating this defect. However this same type of narrow periodontal defect can also be caused by an abscess draining through the periodontal ligament. 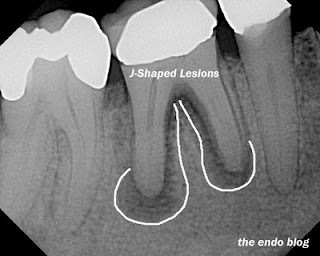 A j-shaped lesion is often associated with vertical root fractures. However, not all j-shaped lesions are fractured roots. In this case there were no fractures found. Complete resolution of these lesions is expected. If visualization of a vertical root fracture is the most accurate way to diagnose a root fracture, how is that to be done? Visualization of a fracture is best done using a microscope. A microscope with a light source will allow you to see fractures during endodontic treatment. or if it crosses the pulpal floor. 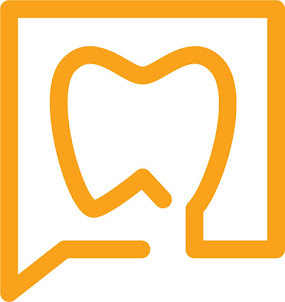 Visualizing a crack running across the pulpal floor of the tooth is (on left) is a 100% accurate diagnosis. This tooth must be extracted. 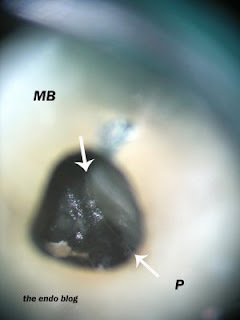 This is another example of a crack running along the floor of the pulp chamber from the MB root to the Palatal root of a Mx first molar. In most cases, I prefer to verify a fracture before extraction. This is time consuming and not very profitable, but I believe it is in the patient's best interest. This is also the course I would take if it were my tooth. nice pitures. A photo says a thousand words.